The Intrepid Museum's Space & Science Festival will run from July 23-26 aboard the U.S.S. Intrepid. 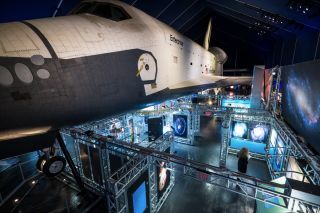 Besides new activities and displays, visitors will be able to explore the Hubble@25 exhibit and see the space shuttle Enterprise inside the Space Shuttle Pavilion (pictured). NEW YORK — Space fans in the Big Apple rejoice: This weekend, the U.S.S. Intrepid is hosting a festival celebrating space and science that will offer displays, exhibits, activities and guest appearances, including by Alan Stern, the New Horizons Pluto flyby's principal investigator, and former space shuttle commander Pamela Melroy. The 2015 Space & Science Festival at the Intrepid Sea, Air & Space Museum will run from Thursday, July 23, to Sunday, July 26. Visitors will hop aboard the Intrepid, a retired U.S. aircraft carrier permanently moored in New York City's Hudson River, to enjoy a long list of space and science-themed events over the course of the weekend. One highlight guest appearance occurs Sunday, when Stern will discuss the latest Pluto discoveries from the New Horizons spacecraft, which flew by the dwarf planet earlier this month, on July 14. On Sunday, visitors also have the opportunity to meet Pamela Melroy, one of only two women ever to command a NASA space shuttle. Melroy logged more than 38 days in space over the course of her career. There will also be a "Space Panorama," which the museum describes as a recreation of Apollo's moon landing using only the performer Andrew Dawson's hands, and a family astronomy night Friday to hear about the search for alien life from Steve Howell, a NASA astrophysicist. Every day, visitors will also be able to visit the ship's Space Pavilion to tour the museum's new Hubble@25 exhibit, celebrating 25 years of images from the Hubble Space Telescope and featuring the space shuttle Enterprise suspended above.